What are the Share Settings? The Share Settings allow you to add your app’s Store Listing Links to the iOS App Store and Google Play Store once your app is live. You can also manage the promo page that we generate for you, or upload your own. 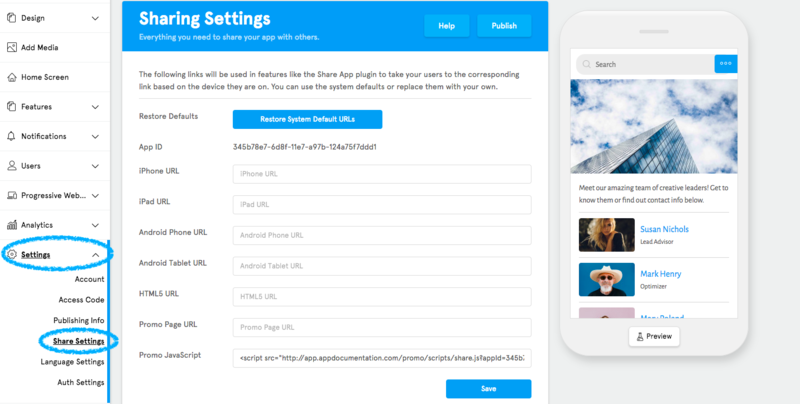 The Share Settings are designed to work in conjunction with the Share App plugin which allows your users to share your app with people who don’t already have it downloaded to their phone. 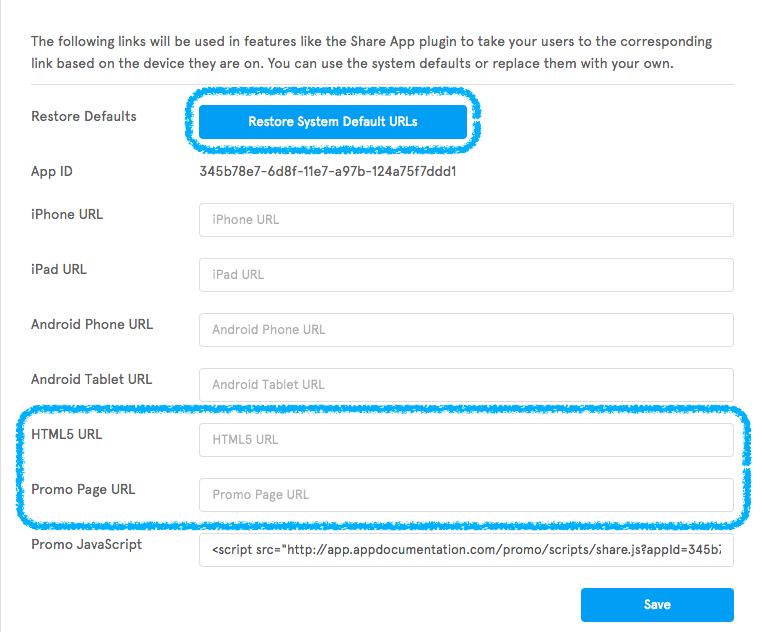 If you would like to learn more about the Share App plugin, you can do so here. In this article we’ll go over how to find the links needed for the Share App plugin and Promo Page to work, as well as some of the other aspects of the Share Settings. Let’s go through the Share Settings line by line. Note: In order to add your app’s Store Listing URLs, your app will need to be live in the app stores. What is the “Restore Default Settings” button and what does it do? If you would like to use these, we recommend that you click the button before entering in the Store Listings Links as it will remove those links when clicked. We’ll go over what the HTML5 and Promo Page URLs are used for later in this article. Note: Make sure you click “Save” after generating the HTML5 and Promo Page URLs otherwise they will disappear when you exit out of that area of the dashboard. What is the App ID and what is it used for? The App ID is an ID unique to your app that is used to identify it in our system. What are the iPhone and iPad URLs and how do I find them? The iPhone and iPad URL sections are where you add your app’s iOS App Store listing link. https://appstoreconnect.apple.comAnd enter in your Apple Developer Account’s credentials. This will open up your app’s listing in the iOS App Store in another tab of your browser. Note: if you decide to change your App’s store name in the future, you will need to grab the URL link again after the app’s name has been changed. This is because changing the app store name will change the URL link as well. What are the Android Phone and Android Tablet URLs and how do I find them? Just like the iPhone and iPad URLs, the Android Phone and Tablet URL sections are where you add your app’s Google Play Store listing link. And click on the “Apps” tab on the left of your screen to access the apps section of the Google Play Store. This will take you to your app’s store listing. Note: Unlike Apple’s App Store Listing URL Link, if you decide to change your App’s store name in the future, you do not need to update the URL link in the Share Settings as it stays the same regardless of your app’s store name. What is the HTML5 URL and what is it used for? The HTML5 URL is a version of your app that you can use for testing purposes, and for devices that aren’t looking for mass market adoption. Just like the PWA (Progressive Web App) the HTML5 version of your app has limited functionality and should only be used as the last option available. Note: In order for the HTML5 link to work, your app will need to be on a Paid plan, and the app has to have been submitted for publishing to our publishing team. What is the Promo Page URL and what is it used for? The Promo Page is a website that we offer that shows people a preview version of your app as well as display a QR code and badges that will take them to the iOS App and Google Play Stores. Note: in order for the QR code and badges to work, the app’s store listing links will need to be uploaded to the Share Settings.